True chrome plating requires several steps. The options would be a customer who currently has painted, machined, or polished wheels and would like to get them plated. The plating process continues with a chemical etching, Copper plating, buffing, bright nickel application, chrome solution, and final rinse. This process can take several days to complete. All tradtiaional plating only includes polish/buff of the face of the wheel - any additional polishing to the inside/outside barrel is an additional cost starting at $150.00. TESTIMONIAL: RGX Rim Repair is absolutely, positively the best in the business! I had extensive curb damage on a 2008 Mercedes SL 550 chrome custom wheel. RimGuard repaired and re-plated the wheel to standards above and beyond my expectations. The wheel looked better than the other three on my vehicle. I was so impressed with the work RimGuard performed on my Mercedes wheel that it made me give my Toyota Tundra pickup truck a facelift by chrome plating 4 custom Enkei wheels. RimGuard again exceeded the standard by providing a high quality product backed by excellent customer service. Thank you for a job well done!!! RGX Rim Repair assumes NO responsibility to damage of wheels as they are assumed to be sent to RGX Rim Repair also states that all liability is limited to the amount directly listed on the invoice. RGX Rim repair guarantees 100% customer satisfaction of the chrome plating process itself – not the underlying aluminum rim. Completion time can take in some cases more than 30days depending on the amount of damage. RimGuard Xtreme , Inc assumes NO liability in any non-normal operating use in restored cracked wheels. In some cases wheels cannot be restored, if this is the case the customer is still responsible for return shipment. Wheels that have center bends are irreparable and the customer will be responsible for shipment cost to & from. Occasionally the expectations of the customer may lead them to expect a pristine chrome rim upon return. While this does happen, the results of the rim RE-PLATE actually are based completely off of the quality of aluminum. Any imperfections in the base material may sometimes not be apparent until the chrome layers are removed. Aluminum is a softer metal than the copper, nickel, and chromium finishes and corrosion/porosity will affect this area first if the top prevention layer of chrome is altered. Termites create a similar type of damage to wood that is typically not noticed until the top layers are removed. Once the customer has the tires re- assembled to the rims, the customer has taken full responsibility of the rims and has also fully accepted the rims. There will not be any returns, damage claims, or discounts made after the rims have been re-mounted back to the tires. During the initial phase of dipping rims in copper, if we notice severe porosity (sponge like appearance in the otherwise solid aluminum) we will attempt to restore as much as possible with allowing the rim to remain in the copper vat longer. When the wheel is finalized with the re-chrome it is simply adding a new chrome plated finish. The end results can be dependent on several factors including the age of the wheel, quality of aluminum base material, and condition. It is important to remember that the chrome plating itself is brand new. We stand behind our work 100% - unfortunately we cannot control the underlying aluminum metal and the imperfections caused. While the above mentioned items are often rare, we find it is important to make sure the customer understands the possibility. We offer the warranty and customer satisfaction to the chrome plating itself and back the plating 100%. Customer is responsible for removing all plastic rivets or they could be damaged. Chrome Wheel Exchange - Easier than ever! This process is an great alternative to traditional chrome plating and carries a 3 year warranty against manufacture defects under normal operating conditions. Approximate time until customer return 3 weeks. •First a primer powder coat is applied. •Second a leveling powder base coat layer is applied to reduce or remove any imperfections in the wheel prior to applying the metal layer. 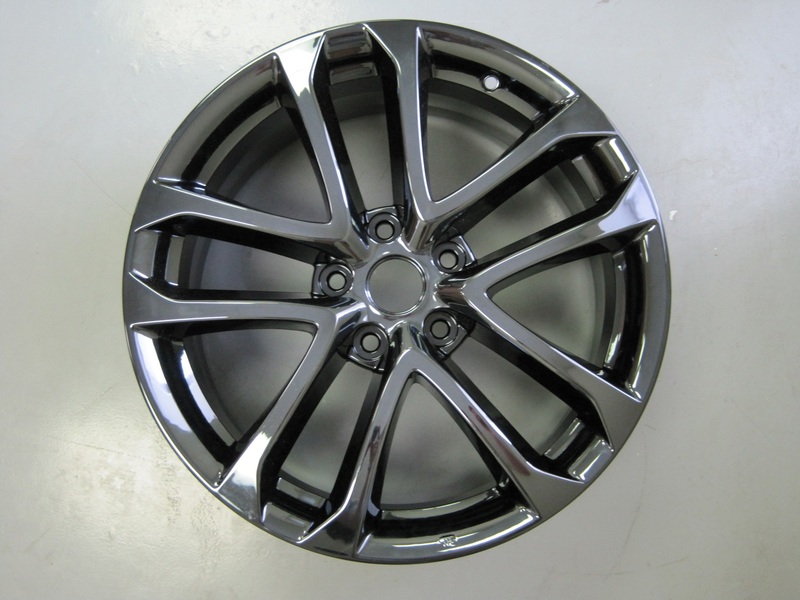 •The wheel is coated with a chromium alloy which is applied utilizing Particle Vapor Deposition in new state-of-the-art chambers that have been specially built for coating alloy wheels. Our single metal application ensures consistency in color part after part. •Finally, a powder clear coat is applied to protect and seal the finish.